In a large skillet, heat the olive oil over medium-high heat, then add the garlic, and sauté until golden, about 2 to 3 minutes. Add the clams, white wine, and stock and cover. Allow to boil until the clams open, about 4 to 5 minutes. Meanwhile, boil the capellini in the water, which you’ve salted, until al dente. When all the clams have opened, discard the unopened ones. Stir the capellini and 3 tablespoons of the chopped parsley into the pan juices. Season with salt and pepper. 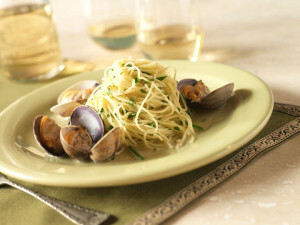 Serve on a platter with the clams and sprinkle with the reaming parsley.